Logs in Scotland - Firewood Logs for Woodburning Stoves - Delivered Direct to Stirling, Falkirk and Dunfermline. Wood fires are growing in popularity due to soaring fuel costs and the growing desire for self-sufficiency and sustainability. Choosing wood as a heating fuel for your home is a lifestyle choice. Good fires are the result of acquired knowledge and practice AND TOP QUALITY FIREWOOD! And that's where we come in. 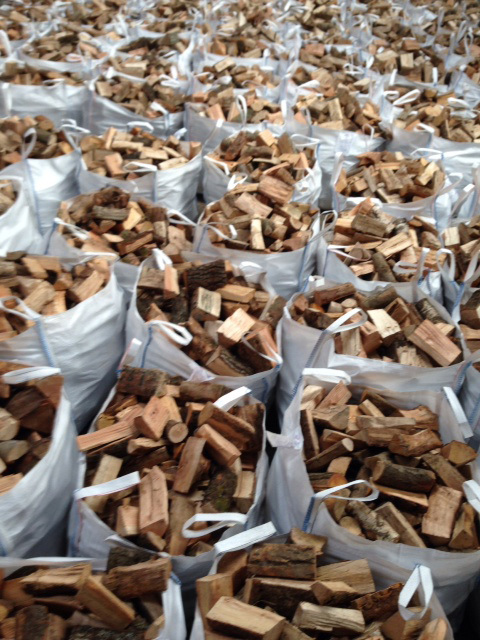 Here at LogLine Limited we are honest, reliable and friendly suppliers of local firewood. You can buy from us with total confidence - see our many testimonials for confirmation. Our timber is fully seasoned undercover for between two to three years, by which time the moisture content averages 20%. We regularly measure the moisture content of our firewood to make sure the quality is consistent. As the air humidity can effect the surface moisture of the logs, we recommend filling your basket and taking them into the house 24 hours before burning them. We sell only the very best quality hardwood/softwood mix in handy nets or builders' bags at competitive prices and with the convenience of free delivery throughout Stirling, Falkirk, West Fife and the Ochils & Hillfoots. (Please see 'Delivery' page for full list of places we deliver too). The sun is shining (at last) and for those of you who like nothing more than relaxing in your garden in the evenings, remember our logs are perfect for your chiminea or firepit. Ten jumbo nets delivered for £50. That's got to be better value and far less hassle than trips to the garage or supermarket! The Summer Sale is now finished for another year. We would like to thank all of our customers who took advantage of purchasing our cut price logs. Help you stack the logs. To compliment this we also offer a Chimney Sweep service. At LogLine Limited we take great pride in the first class customer service we provide. We have many happy customers who place regular orders with us. See our testimonials.